So I dumped a bunch of money on a gym membership for my mom, and got her a bunch of sessions with a personal trainer. Her weight was really bothering me, and it's purely for health reasons. I love my mom and don't want her to die. 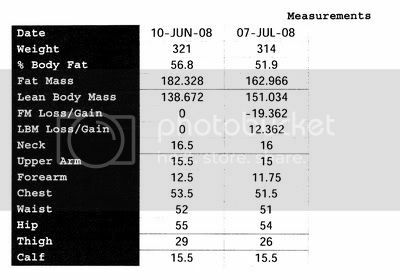 Anyhow, I got her printout from 24 hour fitness today, and was pretty happy with the results. The personal trainer is mainly to get her into the gym, and it seems to be working. I'll buy a bunch more sessions when these expire, too.